This is a far cry from TCBY. Imagine your favorite Greek yogurt: so creamy and delicious. Now imagine it frozen. That's what I'm talkin' 'bout. A very lucky little girl. The easiest way I know to make them is just to stick 'em in a hot oven and don't bother them too much. 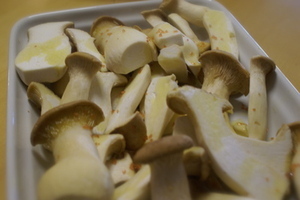 You begin with beautiful raw mushrooms, ends trimmed. Toss them with olive oil, garlic, and alae (pink) Hawaiian salt (or sea salt). I served these alongside lamb chops when the smart and soignée Katherine came to dinner a few weeks ago. This salad is so easy to prepare it's stoopid. The key, though, it making sure you serve it immediately after you toss it so that the salt doesn't have a chance to wilt the cukes. 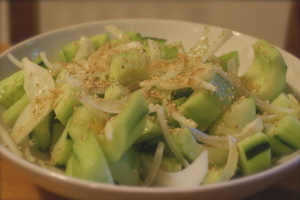 I like it when the cucumbers are still icy-cold from the fridge and you get the pleasant crunch of sea salt with every bite. The recipe calls for ground toasted sesame seeds (You can find sesame seed grinders at any Japanese market. ), but if you can't find a grinder a mortar and pestle will work. Or just sprinkle them on without grinding. optional: shaved garlic is great in this, so are a few very thinly-sliced green chilis. Toss everything together and serve immediately. 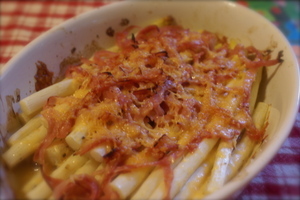 Serves 4 as a side dish (or two of my children--they love this). We had this along-side kalbi (Korean BBQ ribs) last night. Last weekend we took our girls to "Grandpa's" pumpkin patch down the street. It's your basic pumpkin patch/bouncy house/carnie-run affair. Bunny had lost some privileges so she wasn't able to participate in the bounce action (maybe this weekend), but she seemed content to look for pumpkins, especially since her little sister was too scared to jump in the bouncy house. After wandering around the pumpkin patch for a bit, she turn to face me with a bright idea. "Let's make pumpkin muffins!" she squealed. "Can we?" This salad, is hands-down, my family's favorite. What's not to love about thick slabs of sweet, juicy heirloom tomatoes; thinly-sliced piquant onions; and crumbles of sharp and salty blue cheese (in this case Stilton and gorgonzola)? 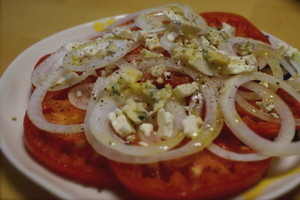 Simply arrange the tomato slices on a plate and lightly salt them (just a touch to bring out the tomato flavor; the cheese is salty), top with onions and cheese and fresh ground pepper, then drizzle with fruity olive oil. We had this alongside grassfed tri-tip from Whole Foods, and it was the perfect complement to the meal. We're not one of those couples that can ever finish a bottle of wine when we open it to drink at home. I don't know why, we just don't. Actually, I have a theory: I love the first glass of red wine. After that, the thrill is gone, as it were. So inevitably, we end up with 3 or 4 partially filled bottles of red wine sitting on our counter. If I don't use it for sauces within a week, then it just goes to waste and gets dumped. But in the fall and winter, those bottles of wine go into coq au vin (or coq "faux" vin), beef stew, lentil stews, long-simmering tomato-beef ragus for spaghetti, and if I have a lot if it, into boeuf bourgignon. Traditionally this beef stew is made with burgundy, but tonight I used cabernet, a petit syrah, and a cabernet/petit syrah blended table red. I think it came out great if I do say so myself. I made a big batch tonight because tonight is when I felt like cooking it, but we'll have it on Friday night when we have friends to dinner. (The bowl above was devoured by my husband who decided someone needed to taste it to make sure it will be fit to serve.) This recipe makes a lot because I had a lot of wine to use up. You can make it all and freeze half for another time, or half the recipe. Heat 3-4 glugs of olive oil in a large Dutch oven over high heat until it starts to smoke. Season the meat with salt and pepper. Working in 3-4 batches, sear the meat until very brown on all sides. Add a little more olive oil as needed with each batch. Set meat aside. Continue searing until all meat is browned. This takes a while so be patient. Reduce heat to medium and add the onions. 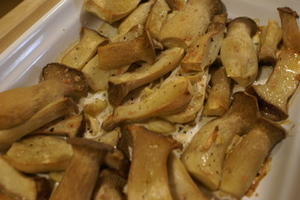 Salt and pepper them and cook for about 15 minutes, until soft and translucent. Stir them often. Sprinkle in the flour and cook for about 5 minutes more. Slowly add in the wine stirring contantly, scraping up the browned bits from the bottom of the pan. Bring to a boil and when you can no longer see any lumps of flour, add the meat and accumulated juices back into the pot along with the garlic and bay leaves. Add water as needed to make sure the meat is fully covered with liquid. 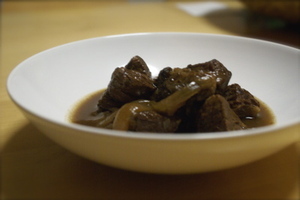 (Don't worry, this will reduce and the stew will not be "watery.") Bring to a boil, then reduce heat and simmer partially covered for 3-4 hours until meat is fork-tender. If you want some veg, add about 6 carrots, cut into 2-inch hunks with about an hour left to go. 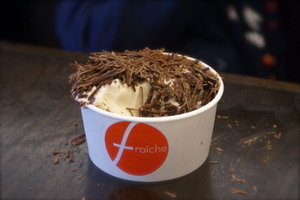 It's much better the next day, so wait to eat it if you can, otherwise, dig in. Serve with mashed potatoes or boiled new potatoes or buttered pappardelle or egg noodles. Serves 8-10. This classic Italian dish is the perfect way to transition from summer to fall. You combine hearty leftover bread—the drier the better—with juicy tomatoes, basil, and olive oil. Some people like to add all manner of things like cucumbers or peppers or olives. I'm a purist and I like to keep it simple. I might add some thinly sliced sweet red or yellow onion or a splash (just a splash) of red wine vinegar, but I try to let the tomatoes shine through. For this recipe, I used about 1/3 of a loaf of very stale La Brea Bakery whole grain loaf, three large and juicy heirloom tomatoes, a couple handfuls of fresh basil, about 4 glugs of fruity olive oil (use the best you have), half a thinly sliced onion added just before serving, a slug of red wine vinegar, and salt and pepper. You need to start the recipe at least two hours before you serve it. The best part about it is that it needs no refrigeration, in fact, refrigeration destroys the flavors, so make sure to keep and serve it at room temperature. Dice bread into 1-inch cubes, and layer into a bowl. 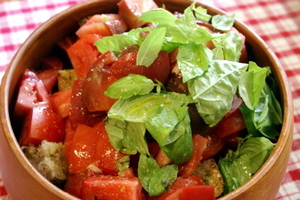 Placed chopped tomatoes (no need to seed) and any accumulated juices into the bowl atop the tomatoes. Salt the tomatoes, drizzle olive oil over everything, scatter basil over the top, and just let the bowl hang out on your kitchen counter for 2-4 hours. Just before serving, add the onions and a splash of vinegar. Toss well. Salt and pepper to taste, and add a touch more olive oil. Serve. Serves 4. You can also omit the last step and just serve it after the bread has had a chance to absorb the tomato juices. We're huge fans of Matisse & Jack's bake-it-yourself healthy energy bars. These are the best-tasting energy bars I've ever had—they are like eating a treat rather than something healthy which means they are perfect for a "guilt-free" dessert night. 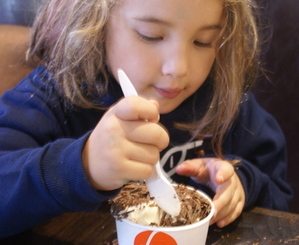 Mixing up a batch takes about a minute and best of all kids can help. You add 2/3 cup of applesauce and 1/2 cup of vanilla yogurt to the dry mix, then you spread the mixture into a pan and bake for 30 minutes. 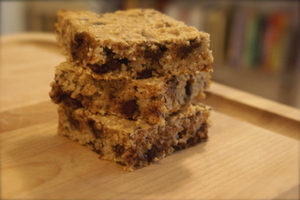 One pan makes enough bars for two girls to have a school snack every day, but since most kids like variety, you can also freeze them and take them out as needed. We've tried cranberry walnut and the chocolate chip. Guess which version mamma likes better and which version the girls like better? Points to Matisse & Jacks for being a local (to me) company—which I'd rather support than some huge granola bar conglomerate.